Royal Asiatic Society. Lecture. 18 January. London. I doubt many of you will be at a loose end in London tomorrow evening, but if by chance your date has stood you up, or your heating has packed up, you might find warmth and distraction at the Royal Asiatic Society. I will be offering hot air on the subject of looting in Tibet. 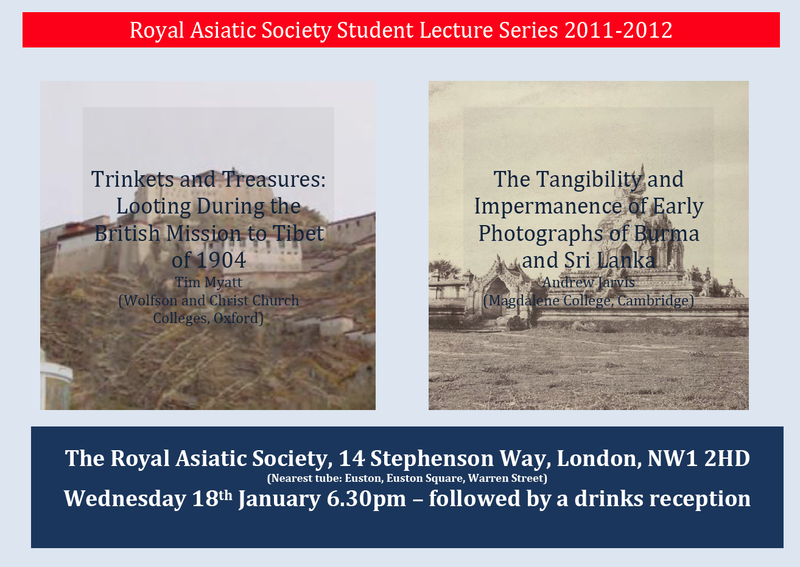 RAS Student Lecture Weds 18th January. The next student series event at the RAS will take place next Wednesday evening 18th January and we have a very interesting double bill of lectures lined up. You can read all about it on their blog here. Timothy Myatt will speak on ‘Trinkets and Treasures: Looting during the British Mission to Tibet of 1904’. Tim’s interest in Tibetan history and culture was stirred after spending eight months teaching in the Tibetan Monastery of Dip-Tse-Chok-Ling in Dharamsala, India, close to the Tibetan Government in Exile. He is now a doctoral student of Tibetan and Himalayan Studies at Wolfson College, Oxford and the General Secretary of the Internal Seminar of Young Tibetologists and has edited and published numerous books and papers on Tibetan culture, history and Anglo-Tibetan relations. I will present new research examining looting during the 1904 Younghusband Mission to Tibet. I will outline the social and cultural milieu that prevailed at the time and note the role models for, and influences on, those who took part in the mission. I will outline the position of L. Austine Waddell, the ‘archeologist’ to the Mission, and the controversial methods he used to acquire both personal and official collections. The aftermath of the Mission will be studied, focusing on contemporary newspaper reports from London and Delhi concerning the looting. I will then show how selected items looted from Tibet are now presented in British museums and collections, before studying the mentality behind the collectors and their desire to construct archives of achievement and ‘Temples of Empire’ that rationalize a perspective of ‘the other’ and thereby, themselves.